During the Great Depression, Herbert Taylor, president of the Club Aluminum Company, and his wife Gloria provided bread and soup for long lines of people at a small storefront mission on the near north side of Chicago. As part of their ministry to the community, they surveyed 2000 homes in the neighborhood and discovered that 50 percent of the children never attended church services or Sunday school. “This simply can't continue!” the couple concluded. Using stock from Herb's aluminum company to create the non-profit Christian Workers Foundation, the Taylors determined to help finance organizations capable of reaching the unchurched young people of America. What began in a storefront mission came to focus on the world. War clouds were building over Europe, and America's evangelical Christianity had to change. Among the ministries encouraged by the Taylors was Youth for Christ, a vibrantly attractive movement among Christian youth during and just after World War II, and a training ground for new evangelical leaders. The movement had no founder; it had an explosion—driven by a deep concern for America's youth and future. YFC began in the hearts of people like Herb and Gloria Taylor who sensed that a new day had come to America, an hour of need. Probably the first youth rally director in America was fiery Lloyd Bryant, who organized weekly rallies for youth in the heart of Manhattan during the early 1930s. The youth rally became nationally known, however, when a converted insurance salesman and dance band trombonist named Jack Wyrtzen launched a radio broadcast in Manhattan. He called it “Word of Life Hour” and then linked it with rallies held at Bryant's old meeting place, the Christian and Mission Alliance Tabernacle in the heart of New York City. The first rally came on October 25, 1941. Then came the war and the huge rallies. Word of Life moved to Carnegie Hall but soon outgrew it too. Several rallies, beginning in 1944, drew more than 20,000 to Madison Square Garden, and radio soon carried the revival spirit across the land to Detroit, Washington, D.C., Indianapolis, St. Louis, Minneapolis, and a thousand smaller towns in between. Radio may be key to understanding the movement, according to historian Joel Carpenter. Torrey Johnson and Bob Cook, two young pastors in the Chicago area, sensed that radio broadcasts of the rallies had immense symbolic and practical value. Not only was radio good for publicity and extended impact, but it also added to the legitimacy of the event. It made the audience feel they were “part of something big, and alive, and vital.” This striving for an image of significance and eventfulness, says Carpenter, prompted rally directors to emulate radio celebrities. Jack Wyrtzen and later Billy Graham clearly patterned their preaching after the clipped, rapid-fire urgency of radio newscasters. George Beverly Shea—later widely known as the bass soloist of the Billy Graham team—was on the staff of the Moody Bible Institute in Chicago. Shea and a few friends decided it was time their city had a rally too. Shea had worked with Jack Wyrtzen in New York City and now urged Torrey Johnson, pastor of the Midwest Bible Church, to take the leadership of a Chicago rally. After some hesitation, Johnson agreed to organize the event and, surprisingly, secured prestigious Orchestra Hall for 21 Saturday nights in the summer of 1944. For the first night's preacher he turned to a young, neighboring pastor: Billy Graham. Huge crowds came, and media types took note. Rally after rally followed a similar pattern: Saturday night in a big auditorium, lively gospel music, personal testimonies from athletes, civic leaders, or military heroes, and a brief sermon, climaxing with a gospel invitation to receive Jesus Christ as Savior. This was revivalism tailored to youth. With World War II raging, appeals to the patriotic spirit at the YFC rallies were open and direct. The Pauline images of faith, manhood, spiritual conflict, and heroism were too obvious for a talented speaker to ignore as he looked into the faces of huge wartime audiences. Some “Victory Rallies” were truly massive. Word of Life filled Madison Square Garden twice in the spring and fall of 1944, and 60 to 70 thousand people attended Chicagoland Youth for Christ's Memorial Day pageant at Soldier Field in 1945. During the course of the huge rallies in Chicago, the Hearst newspapers carried a full-page story of the new youth movement now reaching half a million young lives every Saturday night. When right-wing preacher Gerald L. K. Smith came out in support of Youth for Christ, charges of fascism surfaced. 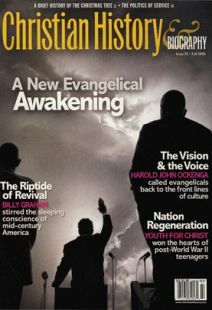 The liberal journal Christian Century put no stock in the fascist charge but did roundly criticize “this streamlined evangelism” for “milky abstractions” and its lack of concern for social and ethical problems. Still, the leaders of Youth for Christ knew what they were about. YFC was simply geared to its own times. Among the movement's rally directors, there was a preponderance of former dance band members and radio disc jockeys. Pastors with radio-preaching experience were also numerous, as were people with careers in journalism, printing, and advertising. As a consequence, YFC leaders, especially in the larger cities, received a good share of news coverage. The message was clear: YFC mattered in American life. On July 22, 1945, 42 delegates met at Winona Lake, Indiana, for the founding of Youth for Christ International. Torrey Johnson was elected president and immediately recruited Billy Graham as the first full-time evangelist for the movement. The young itinerant traveled 135,000 miles that year, and United Airlines cited him as their leading civilian passenger. In two years' time Graham preached in 47 of the 48 states and throughout Canada. By the fall of 1945, the war was over, but Youth for Christ had hardly begun. Chaplains, GIs and missionaries provided a bridge for overseas expansion. “Who knows,” said Torrey Johnson, “but what we've got an army of occupation for the purpose of establishing Youth for Christ.” Rallies appeared around the globe, from Paris to Manila, from London to Okinawa, from Seoul to Venezuela. When the YFC Convention met at Winona Lake in 1948, Johnson, re-elected president for a third term, reported that the international office was “in touch” with 800 rallies in North America, and Billy Graham announced that YFC teams had gone to 46 countries the previous year. Early in the summer of 1948, Torrey Johnson shocked the fourth YFC Convention at Winona by asking that he not be renominated for president. His reason, he said, was to “travel more in evangelism.” He recommended Bob Cook to succeed him and, in spite of some objections, the convention elected Cook. Under Bob Cook's leadership, YFC continued its vigorous evangelistic efforts, including scores of teams sent overseas, but the new president sensed that the movement could not keep running on promotion and enthusiasm alone. He deplored the “talented opportunist who was in YFC for self-interest.” And as a result, he drew guidelines for rally directors and stressed financial accountability. By 1951 Cook was convinced the one-shot rally approach was in serious trouble in many cities. “The rally idea,” Cook said, “is sound but in most places the … rally is just the show window. Let's get something on the counters the rest of the week.” What went “on the counter” were Bible clubs. The Kansas City YFC already had a successful club program under the leadership of Jack Hamilton and his wife Mary Jeanne. In 12 high school clubs they led students through the New Testament by a series of quizzes, then staged competitions between clubs at Saturday night rallies. The idea spread across the country when Hamilton left Kansas City to promote the program in other cities. By March 1952, when Time's Henry Luce discovered “a more serious interest in religion in America than in 30 years,” YFC clubs passed the 1,000 mark. By 1955 Jack Hamilton, in the national office, reported 1,956 clubs in 41 states and seven foreign countries. Clearly, YFC Bible clubs had become for the 1950s what Saturday night rallies had been for the '40s. Bob Cook also noticed that YFC was reaching “comparatively few from the so-called 'seamy side of town. '” One reason, he said, “is that so much of our advertising and programs are slanted to happy Christian youngsters. Let's do something to reach the teens outside.” And so the ministry introduced the Youth Guidance Program with its summer camps for delinquent youngsters. Ten years after the organization of YFC, many of the early leaders had moved on to other endeavors. Billy Graham built his evangelistic team of former YFC leaders—including business manager George Wilson, crusade organizer Walter Smyth, song leader Cliff Barrows, associate evangelist Leighton Ford, and pianist Tedd Smith. In a sense, Billy Graham never left YFC; he took it with him to the world. The entrepreneurial spirit moved freely in YFC circles, and leaders often created ministries and missionary organizations after their own tastes. As a result of evangelistic junkets in the Far East, Bob Pierce created World Vision. After years of overseeing YFC rallies in Europe, Bob Evans resigned and founded the Greater Europe Mission. While traveling for YFC in North Africa, Paul Freed felt called by God to build Trans World Radio. For a decade the story played out like the refrain of an old love song. While traveling in China, Bob Finley, YFC's second staff evangelist, projected a ministry with international students, diplomats, and businessmen visiting the United States—which became International Students, Inc. The spirit and energy of YFC's Saturday night rallies were slowly but clearly spilling over into wider channels of evangelical expression. By 1955, so many of his former colleagues had left YFC that Bob Cook lamented, “Everybody's bailing out except me.” Two years later, Cook himself resigned as president to accept a position with Scripture Press, a publishing house in Wheaton, Illinois. He left behind a stronger, if less sensational, YFC than he had inherited. Bruce L. Shelley is senior professor of church history at Denver Seminary and author of Church History in Plain Language (Word). Billy Graham's early crusades stirred the sleeping conscience of mid-century America.